Puerto Princesa is the capital city of Palawan and is accessible by plane from Manila and Cebu, as well as overnight ferries from both major cities, as well as ferry from San Jose in Mindoro (to Coron). The Island of Palawan is the new ‘hot spot’ for Philippine tourism as most of its locations have been overlooked for years in favor of places like Boracay and Bohol. Coron and El Nido are the most famous tourism spots located to the north of Puerto Princesa and they are post card picture types of places, however not really feasible to be a Digital Nomad unless you can do everything from your laptop and don’t need a major urban center at short notice. Puerto Princesa is ok as an urban hub, however it is not really comparable to Manila or Cebu as it is very provincial and set up mainly for the port and local business needs. If you want to experience Palawan we recommend it more as a tourist location than a Digital Nomad location, unless of course you can work 100% remotely. Want to set up as a Digitial Nomad in Puerto Princesa and not sure where to start? Get in touch with us now and we can help you get settled. Situated 12 km from Honda Bay, Ai World Park and Resorts offers 3-star accommodation in Puerto Princesa City and features an outdoor swimming pool, a garden and a terrace. The property is located 16 km from Balinsasayaw Restaurant – Rizal, 15 km from City Coliseum and 16 km from Immaculate Conception Cathedral. The in-house restaurant serves Grill/bbq cuisine. At the resort, the rooms have a desk. Complete with a private bathroom equipped with a hot tub and free toiletries, all rooms at Ai World Park and Resorts have a flat-screen TV and air conditioning, and some rooms will provide you with a seating area. The rooms will provide guests with a wardrobe and a kettle. A continental breakfast is served every morning at the property. The accommodation offers a hot tub. You can play billiards and darts at Ai World Park and Resorts, and car hire is available. Mendoza Park is 16 km from the resort, while Palawan Museum is 16 km away. 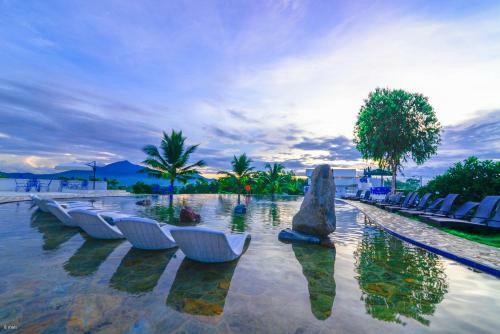 Strategically located on the west coast of Palawan, home of beautiful mountains, lush rainforests, and a variety of wildlife, this resort is just a few hundred meters away from the Subterranean Underground River. Boasting 95 spacious guestrooms and suites, all are tastefully furnished and decorated in a contemporary Asian style with a touch of local culture and come fully equipped with modern amenities for guests’ comfort. The resort also offers a wide range of facilities such as a swimming pool, fitness center, and spa. Sheridan Beach Resort and Spa offers guests world-class luxury and quality services in hospitality which has made this Sheridan property a top destination among accommodations in Palawan. Nestled in a peaceful location a 5-minute drive from the Puerto Princesa International Airport, Paboreal Boutique Hotel is your ideal holiday retreat in Puerto Princesa. Experience a reassuring sense of privacy and the superb hospitality provided by attentive and discreet staff in a totally smoke-free property. Here, you will find an intimate and pleasing experience as well as a home away from home where excellence is both a vocation and a promise to those who share an appreciation for a different way of life. Each room has its own spacious private veranda, stunning and vibrant bathroom with pool and garden views on the first floor and partial sea views on the second floor. Paboreal Boutique Hotel is where the dreams of luxury become reality. Cleon Villas Pension, located in Puerto Princesa, Palawan, is a popular choice for travelers. Set 2 km from the excitement of the city, this 3-star hotel commands an excellent location and provides access to the city’s biggest attractions. With its convenient location, the hotel offers easy access to the city’s must-see destinations. Cleon Villas Pension also offers many facilities to enrich your stay in Palawan. The hotel offers access to a vast array of services, including free Wi-Fi in all rooms, daily housekeeping, private check in/check out, taxi service, Wi-Fi in public areas. The ambiance of Cleon Villas Pension is reflected in every guestroom. television LCD/plasma screen, clothes rack, free welcome drink, linens, mirror are just some of the facilities that can be found throughout the property. Whether you’re a fitness enthusiast or are just looking for a way to unwind after a hard day, you will be entertained by top-class recreational facilities such as massage, garden. Cleon Villas Pension is your one-stop destination for quality hotel accommodations in Palawan.